The restlessly innovative husband and wife team of trumpeter Natsuki Tamura and pianist Satoko Fujii have produced some of the most intriguing and invigorating music to come out of Japan. Although rooted in the jazz idiom, their explorations are on universal themes, drawing upon a variety of inspirations. Their work is primarily improvised, but not in the sense of a blowing session and more within the permissive construct of melodic and unconventional compositions. 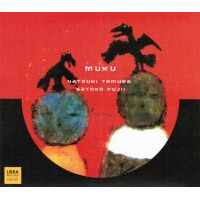 More often than not, it is Fujii who pens the pieces on their albums, but on Mukumeaning "purity" it is Tamura who assumes the role of the tunesmith. As the title of this duo recording suggests, the stripped-down sound of two instruments is clean and free of rhythmic flourishes. The title track opens with crepuscular piano lines blended carefully with silent pauses. The distinctly Japanese melody is played in unison. Tamura peppers the Asian harmonies with Latin sounds. His gentle, breathy horn flutters between carefully placed bursts of Fujii's note clusters. This type of east and west musical amalgamation is one of the album's leitmotifs. "Dune and Star" opens with Tamura's melancholic and longing tones backed by occasional bursts of piano notes. Fujii's atmospheric vamp has strong eastern sensibilities as it plays behind Tamura's bluesy and complex lilting improvisation. Although a strong lyricism runs through the album, it is not without its share of angular and mordant freedom. "In Barcelona, In June" is a romantic piano sonata enhanced with mellifluous, muted trumpet, which evolves into a fiery, unfettered and edgy extemporized duet. "Clone" is an avant-garde exploration of the piano's range, with Fujii creating dark soundscapes filled by Tamura's warm yet piercing fills. The seemingly dissonant exchange between the two endows the tune with certain theatricality. Like a modern day Joe "King Oliver and Jelly Roll Morton, Muku is a musical summit of kindred spirits that is destined to be a classic.